We recently discussed how to shop safely online during the holiday season. All of the points in that article also apply to shopping all year round, and are good practices to develop to ensure that your online activity is safe. But there are also some other things you can do to make sure that you surf safely, even when you’re not shopping. 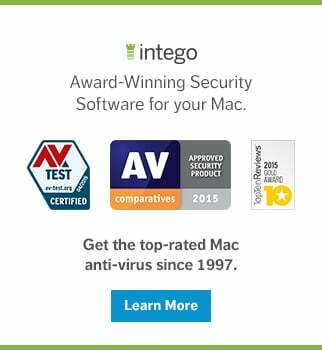 Here are three tips to surf safely online, on both OS X and iOS. No matter which web browser you use, you should make sure it is always up to date. 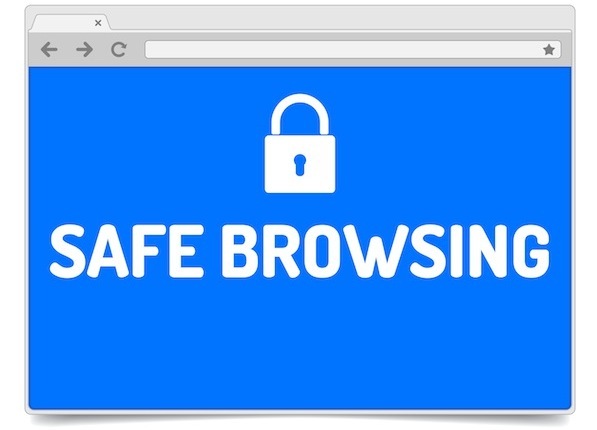 This is essential because all browsers regularly apply security updates to protect against newly-discovered exploits, many of which can be injected into websites, even popular ones. 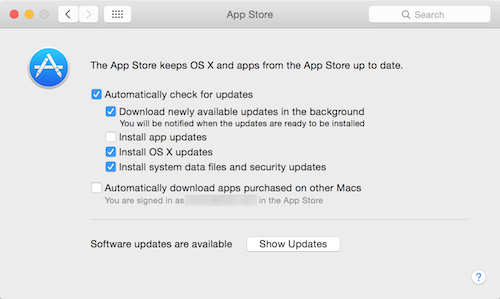 If you use Apple’s Safari, have the Mac App Store app check for updates automatically, and have it install OS X updates and system data files and security updates. 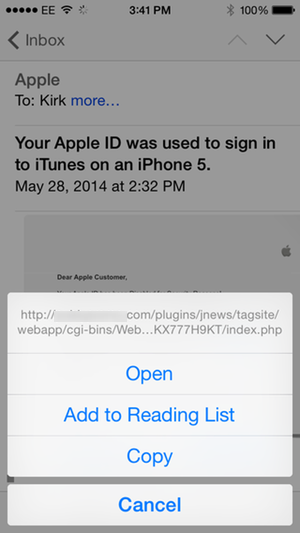 To do this, open System Preferences, then click App Store. Check the following options: Automatically check for updates, and, ideally, Download newly available updates in the background. Also check Install OS X updates and Install system data files and security updates. If you use Google Chrome, it updates automatically in the background. However, if you run Chrome regularly and don’t restart it, it may not update. If so, the Chrome menu, at the right of the toolbar, will change to green, orange or red to alert you. See this Google technical note to learn more. Firefox also updates automatically when you launch it, if updates are available (unless you turn this feature off in Firefox’s Advanced preferences). It tells you that an update is available, and prompts you to restart it. On iOS, you’ll see updates to all your apps in the App Store app. Make sure to check it regularly and update apps you use to access the internet as soon as you can. This looks more or less like an email from Apple. But if you look closely, you can see a few grammatical errors (“from other IP address,” and “Disabled” with a capital D), but also a somewhat archaic subject line, which mentions an iPhone 3. In both of these cases, you can see that these are not Apple URLs. 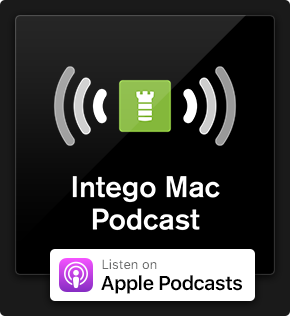 The risk here is that, if you log into your account after clicking one of these links, you’ll be taken to a page set up to harvest your credentials, which can then be used to empty your bank account, or buy lots of stuff on the iTunes Store. It’s easy to assume that most such emails are bogus. 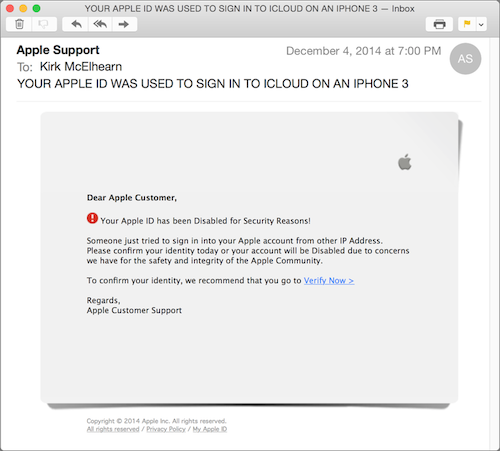 But Apple does send you emails if you log into your iCloud or iTunes Store accounts from a new device, so you do sometimes get authentic emails like this. And your bank or credit card company may send you emails as well. To be safe, always check the URLs behind the links, or log into your account by manually typing the URL in your browser. Not long ago, a friend of mine posted on Twitter, saying something like “This Famous Person shares the same exact birthday with me!” That’s an interesting tidbit to discover, but I replied to his tweet, saying, “Congratulations, you’ve now told the entire Internet your birthday.” He promptly deleted his tweet. You’re bound to give out information about your life when you discuss things with people, when you post on Facebook or on forums, or if you have a blog. But make sure you know that some of that information has a risk. Some of these questions may be easy to figure out. For example, if you had a nickname as a child, you, or a friend, may have mentioned it on Facebook. And you might have mentioned your best friend in high school; you might post about going to his or her wedding, for instance. You might have a discussion on Twitter about cats, you mention the name of the first one you had. And the name of your favorite sports team? Half my Facebook friends post about sports, and that would be easy to guess. There are two approaches to dealing with these questions. 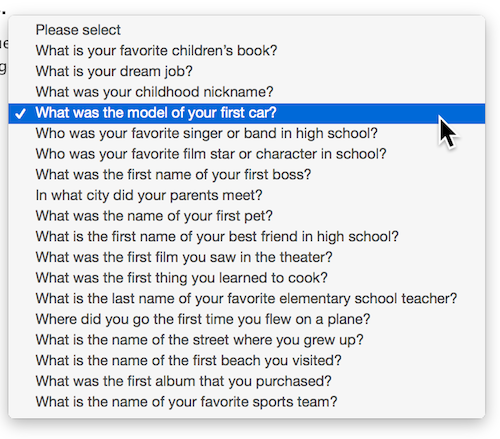 The first is to choose the most obscure ones, things you'll likely never mention online. This could be the first thing you learned to cook, the name of your first boss, the first beach you visited, or the first destination for a plane trip, for instance. In other words, there's no harm in having some fun and giving an answer that no-one else on the Internet will be able to guess, especially if it offers greater protection. You don’t need to supply the answer to the question that is asked. You could reply Ed Norton, or Mister Mxyzptlk, or use some random characters, if you wish. Or use a phrase, such as a favorite quote, or a line from a song. It’s a good idea, though, to use something memorable, because you may need this information to reset your password. Use these three tips to keep your online activity safe and secure. This entry was posted in Security & Privacy and tagged identity fraud, internet, iOS, OS X, phishing, privacy, safe browsing, web browsers. Bookmark the permalink. I try to forward phishing emails to the alleged senders for them to follow up. The only bank that hasn’t emailed me is the one I use!!!!! What other apps or techniques do you use to keep your iOS device safe and secure?